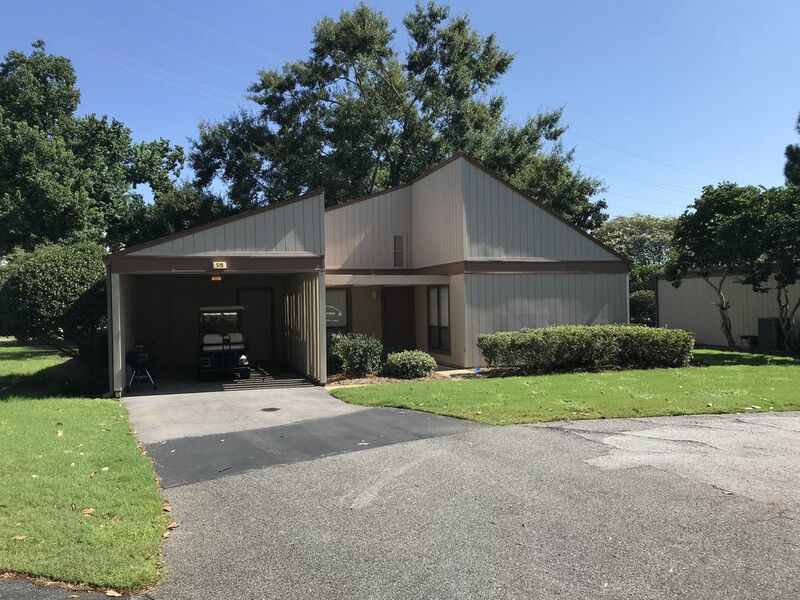 This 1300 square feet, two bedroom, two bath detached Villa is located on Sandestin Golf and Beach Resort, seven miles east of Destin, Florida and one mile from Silver Sands Outlet Mall. Sandestin is one of the top resorts in Florida. The house is on gated resort property with full security, one mile from the most beautiful beaches anywhere. To learn more about the Sandestin Resort, please Google Sandestin Golf and Beach Resort. The house is situated on a quiet cul-de-sac on the resort. Each bedroom has a plush king-sized bed and a TV with 99 channels of cable TV (three TVs total). The screened-in patio views the resort's bike-path that encompasses all of Sandestin. The unit is set on one third of an acre with lovely landscaping. Recently tiled and painted, kitchen updated and added decorations. Wall mounted flat screen TVs throughout. HIGH SPEED WIRELESS INTERNET (Cable). Kitchen has all the goodies necessary to cook what you want (though I bet you eat out at many of the fine local restaurants more than you cook!). Please check the calendar to determine if the condo is available for your dates. If Augusta is not available, please look at our Bayou Village property at vrbo 474988. If you like what you see and are ready to book, click "Book it" to the right. If you have questions, scroll down and click on "Send Email" to the owner. Keywords: Villa, Sandestin, Destin, VRBO, Summer rentals. Love the gulf coast! Self-employed professionals who travel quite a bit but love to stay in our condo and play on Sandestin when we can. When in town we live about three miles west of Sandestin. Stumbled upon this condo and was so impressed with the area that we bought it! We love Sandestin Golf and Beach Resort so much that we recently bought and renovated another property. See it at vrbo 474988. One of the great things about our condo is that it is a couple of hundred yards from the main gate so it is easy in and easy out. It is also a free standing house so you don't hear the neighbors and they don't hear you. Ample parking for two vehicles. Use the included, free, golf cart to get to the beach, anywhere on the resort or to Publix Supermarket and the stores and restaurants on Grand Blvd. Tubs and showers in both bathrooms. Front loading, high efficiency new in 2013. Please use HE detergent. In the carport closet. New in 2014. Everything needed to cook whatever you like! Basic cable. About 90 channels. Tuner for the radio, listen to the TV through the speakers or plug in your iPod, iPad, phone, etc. to listen to your own music. Some 'left behind' beach toys in outside storage, feel free to use or leave behind more! Some beach chairs and beach umbrellas if they survived the last guests! Large yard, plenty of room for the kids to play and dogs to romp. Please pick up after the dogs AND the kids! Bikes can be rented from the Marina on the resort or one of many local companies. They will deliver and pick up the bikes. Sand pails, floaty thingies, boogy boards. Tennis courts on the resort for rent. Sandestin Golf and Beach Resort has four golf courses on it and there are about 20 more with 20 miles radius. Two pools, each about 800 yards away, one east and one west. East pool heated in the winter. Gated Community, 1 mile to Beach, 2 Pools, located within the Sandestin Golf and Beach Resort, single detached unit with 1/3 acre in quiet cul-de-sac, unique for a busy resort where many units are dense high-rises or attached units, perfect for children, close to renowned Baytowne Wharf attraction with many eating, shopping and entertainment opportunities, rates well below resort managed units, two plush king sized beds, high speed internet (Cable). Great house and great owners! This was our second time renting this house just so we could bring our pup. We love the fact that a golf cart comes with this rental! It’s fun to ride over to the beach, to the wharf or to the Publix shopping area. Couldn’t ask to rent from better owners! If you have a problem, they will take care of it as fast as they can. We definitely recommend! Located on Sandestin Golf and Beach Resort, our condo is centrally located to Scenic Route 30a and the entertainment districts of Destin. Silver Sands outlet mall is less than a mile away and Destin Commons is about 5 miles away. Restaurants abound in the area with The Village of Baytowne Wharf is located on the resort and just a short walk, golf cart or bicycle ride away. Grand Boulevard is a short golf cart ride away without the necessity of getting on Hwy 98 and has many restaurants, a Publix Supermarket, a liquor store, Starbucks, Carmike Cinemas Boulevard 10 and much more.